Phrases like Quality, Precision & World Leaders in Technology are synonymous with BRUDERER when it comes to manufacturing high speed presses, but as many of the components that make our cars are produced from complex tooling within the press, BRUDERER UK can also supply the best in tooling components with its association with market leaders in their own fields. One of these market leaders that BRUDERER UK represent as a sole UK & Ireland agent is FIBRO GmbH, who offer a wide range of tooling components made from the highest quality, ensuring the maximum possible life and performance. 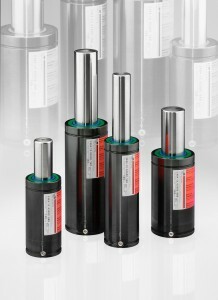 Part of the range is their high quality gas springs. With one million gas springs produced per year – they are the largest manufacturer in the world for high pressure Nitrogen gas springs and systems for use in metal forming applications; with an export level of 95 percent makes them a world leader. Contact our Luton sales team for more info on Fibro gas springs and the full range of Fibro precision press tooling and plastic mould tool components.